Departing from idyllic San Francisco, Silver Whisper will sail for the picturesque shores of Hawaii and then cross the International Dateline to the South Pacific, New Zealand, Australia, Southeast Asia, India and Arabia. You can enjoy more multi-day calls and late-night departures in each destination and incredible options for exploring beyond the shore with Silversea’s award-winning overland journeys to wonders including Ayer’s Rock, the Taj Mahal, and the temples of Angkor Wat. Our 2017 World Cruise departs Miami on January 5, 2017 and returns on May, 13, 2017, after visiting 62 ports of call, for a total of 128 nights. Before embarking on this epic journey, you will enjoy a relaxing 1-night stay with an unforgettable gala at the historic Biltmore Hotel in Miami. Oceania's third Around the World voyage will depart from Miami on January 6, 2017 aboard Insignia. When they launched our first 180–day Around the World cruise on January 10, 2015, they had no idea how successful it would be and that it would become an Oceania Cruises tradition. Reservations for their 2017 Around the World voyage will open on July 29. Insignia's 2017 route will take guests from the southern Caribbean and Pacific Riviera to the Hawaiian Islands and French Polynesia, continuing on to some of Australia and New Zealand's most renowned destinations including Auckland, the Milford Sound, Sydney and Cairns. Arriving in Asia, the sweeping itinerary features several overnight stays, including Bali, Hong Kong, Ha Long Bay, Singapore and Mumbai, along with a two-night stay in Rangoon (Yangon). After overnights in Egypt and Israel, guests will visit several favorites along the Mediterranean such as Rome, Barcelona, Lisbon and Bordeaux before crossing the high seas. Approaching Canada, Insignia calls on Montreal and Quebec, along with a new port, Sept-Îles, and then heads south, visiting a few classic New England ports before eventually returning to Miami, completing this 180-day voyage of a lifetime. 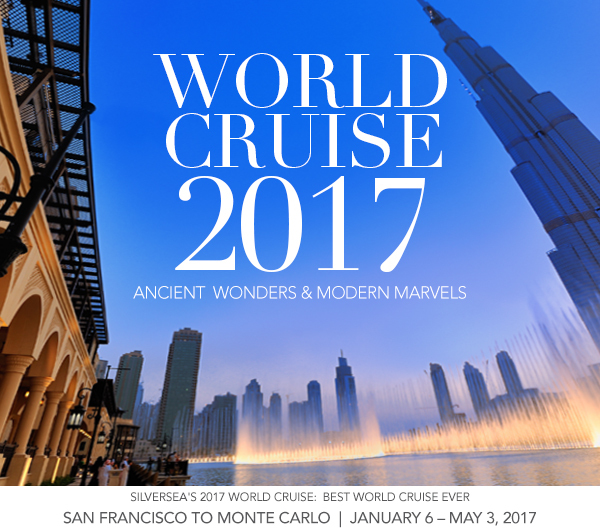 Please click here to download the 2017 Around the World brochure.